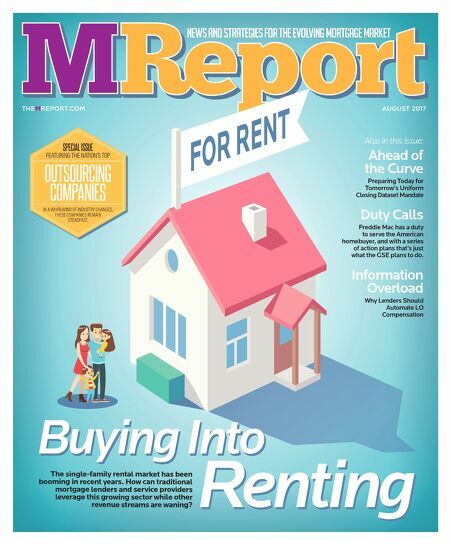 news and strategies for the evolving mortgage market AUGUST 2017 THEMREPORT.COM FOR RENT The single-family rental market has been booming in recent years. How can traditional mortgage lenders and service providers leverage this growing sector while other revenue streams are waning? FOR RENT FOR RENT FOR RENT FOR RENT FOR RENT FOR RENT FOR RENT Buying Into Renting Buying Into Renting Also in this Issue: Ahead of the Curve Preparing Today for Tomorrow's Uniform Closing Dataset Mandate Duty Calls Freddie Mac has a duty to serve the American homebuyer, and with a series of action plans that's just what the GSE plans to do. Information Overload Why Lenders Should Automate LO Compensation SPECIAL ISSUE FEATURING THE NATION'S TOP OUTSOURCING COMPANIES IN A WHIRLWIND OF INDUSTRY CHANGES, THESE COMPANIES REMAIN STEADFAST.